Dylan Marlais Thomas (27 October 1914 - 9 November 1953) was a Welsh poet. He was born in the town of Swansea. He published his first book of poetry in 1932. In addition to writing poetry, he was an excellent speaker. He toured the United Kingdom and the United States reciting his poems. He wrote works for radio including "A Child's Christmas in Wales" and "Under Milk Wood" Thomas is one of the famous people who appears on the cover of The Beatles, Sgt. Pepper's Lonely Hearts Club Band album. In October 1925, Thomas enrolled at Swansea Grammar School for boys, in Mount Pleasant, where his father taught English. He was an undistinguished pupil who shied away from school, preferring reading. In his first year one of his poems was published in the school's magazine, and before he left he became its editor. During his final school years he began writing poetry in notebooks; the first poem, dated 27 April (1930), is entitled "Osiris, come to Isis". In June 1928 Thomas won the school's mile race, held at St. Helen's Ground; he carried a newspaper photograph of his victory with him until his death. In 1931, when he was 16, Thomas left school to become a reporter for the South Wales Daily Post, only to leave under pressure 18 months later. Thomas continued to work as a freelance journalist for several years, during which time he remained at Cwmdonkin Drive and continued to add to his notebooks, amassing 200 poems in four books between 1930 and 1934. Of the 90 poems he published, half were written during these years. In his free time, he joined the amateur dramatic group at the Little Theatre in Mumbles, visited the cinema in Uplands, took walks along Swansea Bay, and frequented Swansea's pubs, especially the Antelope and the Mermaid Hotels in Mumbles. In the Kardomah Café, close to the newspaper office in Castle Street, he met his creative contemporaries, including his friend the poet Vernon Watkins. The group of writers, musicians and artists became known as "The Kardomah Gang". In 1933, Thomas visited London for probably the first time. In early 1936, Thomas met Caitlin Macnamara (1913–1994), a 22-year-old blonde-haired, blue-eyed dancer of Irish descent. She had run away from home, intent on making a career in dance, and aged 18 joined the chorus line at the London Palladium. Introduced by Augustus John, Caitlin's lover, they met in The Wheatsheaf pub on Rathbone Place in London's West End. Laying his head in her lap, a drunken Thomas proposed. Thomas liked to comment that he and Caitlin were in bed together ten minutes after they first met. Although Caitlin initially continued her relationship with John, she and Thomas began a correspondence, and in the second half of 1936 were courting. They married at the register office in Penzance, Cornwall, on 11 July 1937. In early 1938 they moved to Wales, renting a cottage in the village of Laugharne, Carmarthenshire. Their first child, Llewelyn Edouard, was born on 30 January 1939. In 1939 The Map of Love appeared as a collection of 16 poems and seven of the 20 short stories published by Thomas in magazines since 1934. Ten stories in his next book, Portrait of the Artist as a Young Dog (1940), were based less on lavish fantasy than The Map of Love and more on real-life romances featuring himself in Wales. Sales of both books were poor, resulting in Thomas living on meagre fees from writing and reviewing. At this time he borrowed heavily from friends and acquaintances. 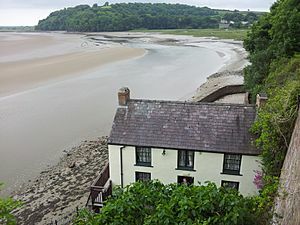 Hounded by creditors, Thomas and his family left Laugharne in July 1940 and moved to the home of critic John Davenport in Marshfield, Gloucestershire. There Thomas collaborated with Davenport on the satire The Death of the King's Canary, though due to fears of libel the work was not published until 1976. At the outset of the Second World War, Thomas was worried about conscription, and referred to his ailment as "an unreliable lung". Coughing sometimes confined him to bed, and he had a history of bringing up blood and mucus. After initially seeking employment in a reserved occupation, he managed to be classified Grade III, which meant that he would be among the last to be called up for service. Saddened to see his friends going on active service, he continued drinking and struggled to support his family. He wrote begging letters to random literary figures asking for support, a plan he hoped would provide a long-term regular income. Thomas supplemented his income by writing scripts for the BBC, which not only gave him additional earnings but also provided evidence that he was engaged in essential war work. In May 1941, Thomas and Caitlin moved to London, leaving their son with his grandmother at Blashford in Hampshire. Thomas hoped to find employment in the film industry and wrote to the director of the films division of the Ministry of Information (MOI). After being rebuffed, he found work with Strand Films, providing him with his first regular income since the Daily Post. Strand produced films for the MOI; Thomas scripted at least five films in 1942, This Is Colour (a history of the British dyeing industry) and New Towns For Old (on post-war reconstruction). These Are The Men (1943) was a more ambitious piece in which Thomas's verse accompanies Leni Riefenstahl's footage of an early Nuremberg Rally. Conquest of a Germ (1944) explored the use of early antibiotics in the fight against pneumonia and tuberculosis. Our Country (1945) was a romantic tour of Britain set to Thomas's poetry. In early 1943 Thomas began a relationship with Pamela Glendower, one of several affairs he had during his marriage. The affairs either ran out of steam or were halted after Caitlin discovered his infidelity. In March 1943 Caitlin gave birth to a daughter, Aeronwy, in London. They lived in a run-down studio in Chelsea, made up of a single large room with a curtain to separate the kitchen. In 1944, with the threat of German flying bombs on London, Thomas moved to the family cottage at Blaen Cwm near Llangain, where Thomas resumed writing poetry, completing "Holy Spring" and "Vision and Prayer". In September Thomas and Caitlin moved to New Quay in Cardiganshire (Ceredigion), which inspired Thomas to pen the radio piece Quite Early One Morning, a sketch for his later work, Under Milk Wood. 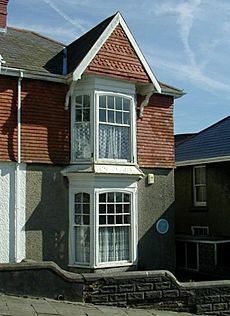 Of the poetry written at this time, of note is "Fern Hill", believed to have been started while living in New Quay, but completed at Blaen Cwm in mid-1945. In the second half of 1945, Thomas began reading for the BBC Radio programme, Book of Verse, broadcast weekly to the Far East. This provided Thomas with a regular income and brought him into contact with Louis MacNeice, a congenial drinking companion whose advice Thomas cherished. On 29 September 1946, the BBC began transmitting the Third Programme, a high-culture network which provided opportunities for Thomas. He appeared in the play Comus for the Third Programme, the day after the network launched, and his rich, sonorous voice led to character parts, including the lead in Aeschylus' Agamemnon and Satan in an adaptation of Paradise Lost. Thomas remained a popular guest on radio talk shows for the BBC, who regarded him as "useful should a younger generation poet be needed". He had an uneasy relationship with BBC management and a staff job was never an option, with drinking cited as the problem. Despite this, Thomas became a familiar radio voice and within Britain was "in every sense a celebrity". Thomas visited the home of historian A. J. P. Taylor in Disley. Although Taylor disliked him intensely, he stayed for a month, drinking "on a monumental scale", up to 15 or 20 pints of beer a day. In late 1946 Thomas turned up at the Taylors' again, this time homeless and with Caitlin. Margaret Taylor let them take up residence in the garden summerhouse. 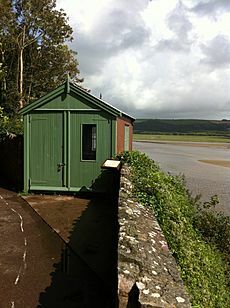 In May 1949 Thomas and his family moved to his final home, the Boat House at Laugharne, purchased for him at a cost of £2,500 in April 1949 by Margaret Taylor. 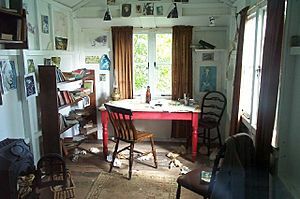 Thomas acquired a garage a hundred yards from the house on a cliff ledge which he turned into his writing shed, and where he wrote several of his most acclaimed poems. 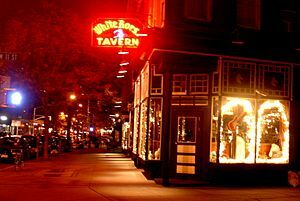 Just before moving into there, Thomas rented "Pelican House" opposite his regular drinking den, Brown's Hotel, for his parents who lived there from 1949 until 1953. It was there that his father died and the funeral was held. Caitlin gave birth to their third child, a boy named Colm Garan Hart, on 25 July 1949. Thomas arrived in New York on 20 October 1953 to undertake another tour of poetry-reading and talks, organised by Brinnin. Although he complained of chest trouble and gout while still in Britain, there is no record that he received medical treatment for either condition. He was in a melancholy mood about the trip and his health was poor; he relied on an inhaler to aid his breathing and there were reports that he was suffering from blackouts. His visit to say goodbye to BBC producer Philip Burton, a few days before he left for New York, was interrupted by a blackout. On his last night in London he had another in the company of his fellow poet Louis MacNeice. The next day he visited a doctor for a smallpox-vaccination certificate. At midnight on 5 November Thomas's breathing became more difficult and his face turned blue. An ambulance was summoned. Thomas was admitted to the emergency ward at St Vincent's Hospital at 1:58 am. Thomas died at noon on 9 November, still in a coma. 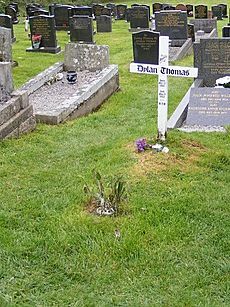 Following his death, Thomas's body was brought back to Wales for burial in the village churchyard at Laugharne. Thomas's funeral, which Brinnin did not attend, took place at St Martin's Church in Laugharne on 24 November. Thomas's coffin was carried by six friends from the village. Caitlin, without her customary hat, walked behind the coffin, with his childhood friend Daniel Jones at her arm and her mother by her side. The procession to the church was filmed and the wake took place at Brown's Hotel. Thomas's obituary in The Times was written by fellow poet and long-time friend Vernon Watkins. His widow, Caitlin, died in 1994 and was buried alongside him. Thomas's father "DJ" died on 16 December 1952 and his mother Florence in August 1958. Thomas's elder son, Llewelyn, died in 2000, his daughter, Aeronwy in 2009 and his youngest son Colm in 2012. Thomas's refusal to align with any literary group or movement has made him and his work difficult to categorize. Although influenced by the modern symbolism and surrealism movement he refused to follow its creed. Instead Thomas is viewed as part of the modernism and romanticism movements, though attempts to pigeon-hole him within a particular neo-romantic school have been unsuccessful. Elder Olson, in his 1954 critical study of Thomas's poetry, wrote "... a further characteristic which distinguished Thomas's work from that of other poets. It was unclassifiable." Olson continued that in a postmodern age that continually attempted to demand that poetry have social reference, none could be found in Thomas's work, and that his work was so obscure that critics could not explicate it. Other poets from whom critics believe Thomas drew influence include James Joyce, Arthur Rimbaud and D. H. Lawrence. William York Tindall, in his 1962 study, A Reader's Guide to Dylan Thomas, finds comparison between Thomas's and Joyce's wordplay, while he notes the themes of rebirth and nature are common to the works of Lawrence and Thomas. 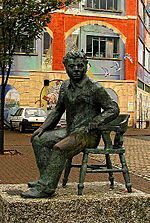 Although Thomas described himself as the "Rimbaud of Cwmdonkin Drive", he stated that the phrase "Swansea's Rimbaud" was coined by poet Roy Campbell. Critics have explored the connection between the creation of Thomas's mythological pasts into his works such as "The Orchards", which Ann Elizabeth Mayer believes reflects the Welsh myths of the Mabinogion. Thomas's poetry is notable for its musicality, most clear in "Fern Hill", "In Country Sleep", "Ballad of the Long-legged Bait" and "In the White Giant's Thigh" from Under Milk Wood. Head of Programmes Wales at the BBC, Aneirin Talfan Davies, who commissioned several of Thomas's early radio talks, believed that the poet's "whole attitude is that of the medieval bards." Kenneth O. Morgan counter-argues that it is a 'difficult enterprise' to find traces of cynghanedd (consonant harmony) or cerdd dafod (tongue-craft) in Thomas's poetry. Instead he believes his work, especially his earlier more autobiographical poems, are rooted in a changing country which echoes the Welshness of the past and the Anglicisation of the new industrial nation: "rural and urban, chapel-going and profane, Welsh and English, Unforgiving and deeply compassionate." Fellow poet and critic Glyn Jones believed that any traces of cynghanedd in Thomas's work were accidental, although he felt Thomas consciously employed one element of Welsh metrics; that of counting syllables per line instead of feet. 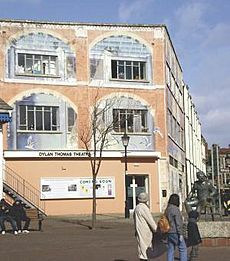 Constantine Fitzgibbon, Thomas's first in-depth biographer, wrote "No major English poet has ever been as Welsh as Dylan". 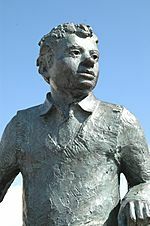 Dylan Thomas Facts for Kids. Kiddle Encyclopedia. 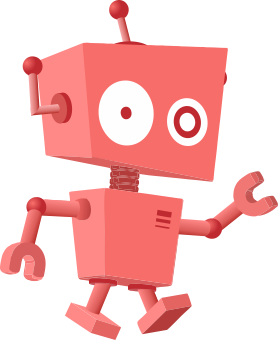 This page was last modified on 15 April 2019, at 05:50.